1) I particularly liked the feedback through the hand paddles. It was unexpected and really enriched the experience (opening drawers, pulling handles, etc.). As mentioned in the Magic Leap article, some other VR experiences give feedback through vests or clothes – maximizing the number of senses involved (while maintaining continuity between them) could be really interesting. I also felt like certain architectural features in the environments took advantage of being able to place the user in them (overhead beams and ledges, for example) that wouldn’t work as well for traditional displays. 2) At one point, I ended up on the menu screen (pressing a wrong button?) and didn’t know how to navigate it. This issue seems hardly specific to VR, but it felt like a stronger clashing of worlds in VR, maybe because I have the expectation that is should be seamless (have as few distractions from the VR space as possible). 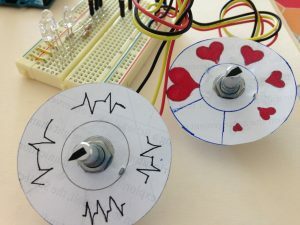 I found it similarly challenging to figure how to use the hand paddles – do the different buttons have consistent functions across environments? Finally, I wear glasses, and while I could see without them, the blurriness somewhat detracted from the experience. I imagine this is a widespread issue, and I’m curious what’s been done for it. So my bot crawls, though mainly in circles (I believe the legs aren’t quite even). I tried to model my bot after knees, which are rigid in one direction (providing push) but bend in the other direction (to avoid undoing forward motion). 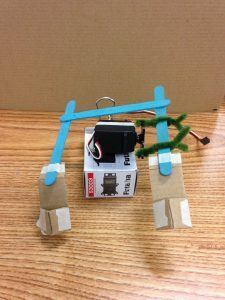 I used binder clips to stabilize the bot’s base (the servo box) and prop the servo motor at a helpful angle. I wanted to make a fan that fights with its on/off switch (hence oscillating between on and off). 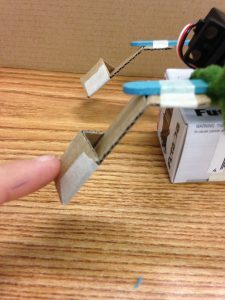 I envisioned a balance-based switch (the paper shape) on top of a force meter. 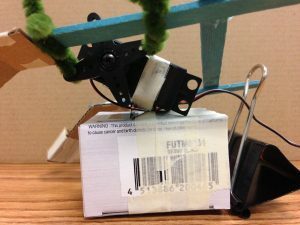 To turn on the fan, you balance the switch on the FSR. The fan turns on, but the breeze it produces pushes the switch off balance, turning the fan off. The switch then comes back to balance, turning the fan on again (and so it continues). A pot is used to control the fan speed. 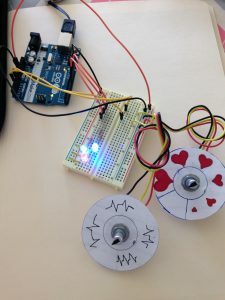 I tried a few fan designs (paper pin-wheel, plastic bottle), but couldn’t get it to produce a strong enough breeze to tip the switch off balance, even at the max pot value. I suspect the blades were slipping on the motor shaft, but I wasn’t willing to glue to it directly. It was challenging to make switch heavy enough to trip the force sensor while still light enough to be tipped off balance. 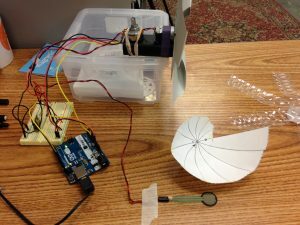 I would try a photosensor next time (mine are currently encased in my last project). * sail, removing the force. I didn't implement the lights. 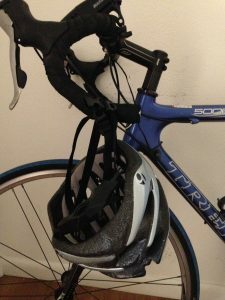 I recognized a trio of “thoughtless acts” around bicycles in my home. On top, I tend to store my bike cable by hanging in on my handlebars. In the middle image, handlebars are again used for storage, here by hanging a helmet. And on the bottom, my bike seat is used to store my helmet, keeping it attached to the bike (it’s clipped around the seat-post) and also in the orientation as it would be worm (by propping it on the seat). 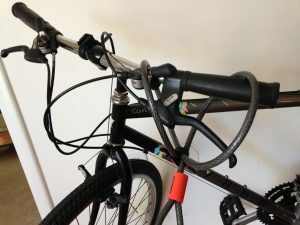 I presume neither handlebars nor seats were designed as storage spaces , but the same features that make for good grips (here protruding or curved, hand-sized grips) also make for good hooks. And my bicycle seat, designed for sitting, happens also to be of the right proportions to mount my helmet (something going on there in human proportions?). As far as design solutions, these inspired me to think of other ways to introduce multi-functionality to items designed for hands/seats. Perhaps the doorknob on a closet door could be grooved, encouraging users to hang their most-used items on the knob itself instead of inside the closet, with similar adaptations for drawer or cabinet pulls. 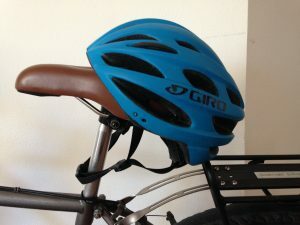 The bike-seat storage seems harder to replicate elsewhere; it works because I only sit on the bike when I am also wearing the helmet (the thing stored on the seat). The same can’t be said for most seats. This rose responds to specific interactions. When a bug lands near the bloom, it turns on, pulsing white light. When a face comes near to the leaf (giving CO2), it calmly pulses blue light. And if you try to pick the flower, squeezing the base of the stem with moderate pressure, it flashes red light. At higher pressure, this flashing is accompanied by a blaring warning sound. At first I wasn’t sure if this was an example of industrial design, but Blauvelt includes the Airborne Snotty Vases and Buildings of Disaster as examples, so I figured it was worth thinking about. 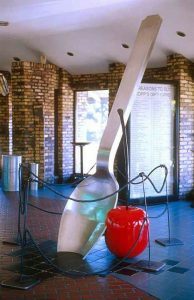 Growing up, our local frozen custard and burger place (it’s the Midwest…) featured a sculpture of a giant spoon and giant cherry (first image below). Though it was not the designer’s (or at least restaurant’s) intention, all the kids wanted to climb on the cherry and slide down the spoon (hence it was roped off). I remember liking it because it was a normal thing, but made really big and somehow that was fascinating, which I think is what Blauvelt’s “transforming the everyday” is about. 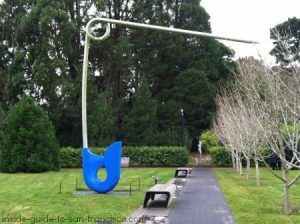 I remember feeling a similar fascination at a mundane thing made big when I saw the giant safety pin sculpture by Claes Oldenburg and Coosje van Bruggen at SF’s de Young museum (second image below). While also meant as an art piece, it reminded me of the spoon and cherry and made me think how “regular sized” objects could take on new functions if they were made bigger or smaller (the spoon could be a slide, the safety pin could be a lamp post). 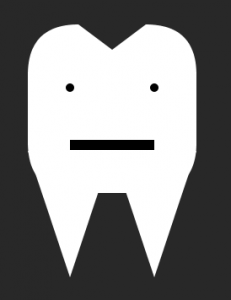 What function might an X serve if it was made really big/small, other than being an X for giant/ants? Some examples already exist: dinner forks and pitchforks, knives and swords, sewing pins and stakes/posts. It was interesting to note the common function of these tools, even if their use contexts are quite different. 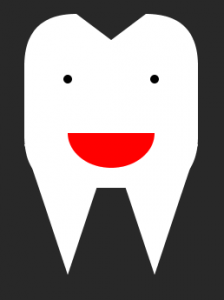 Brushing your teeth too lightly fails to remove plaque and debris, but brushing them too hard can harm the gums and strip tooth enamel. 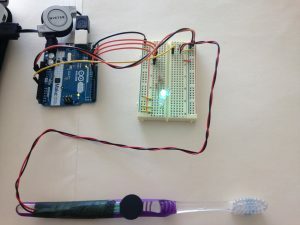 I used an Arduino, a force sensing resistor (FSR), and a toothbrush to indicate (roughly) appropriate force to apply when brushing your teeth. Too little pressure illuminates a green light, the right amount illuminates a blue light, and too much pressure illuminates a red light. 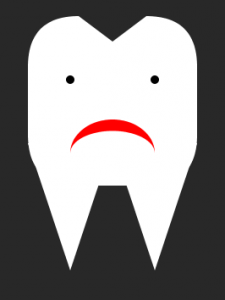 The FSR data is also interpreted by Processing to depict either an underwhelmed, happy, or sad tooth (corresponding to too little, just right, and too much pressure, respectively). I’d be curious about an ambient display of time, particularly one with a medium notification level. It seems like many systems we currently use for time are either low notification level (user poll – I must look to a watch, phone, wall clock, etc. to read off the time) or high notification level (my phone buzzes/a notification pops up on my computer alerting me of an impending meeting). I suppose sunlight could be considered the original ambient information system for time, but how might we increase the granularity of information displayed or make it accessible indoors? There’s also the question of if we’re conveying time (the hour/minutes in a day) vs schedule (time until your next meeting/class/assignment). This line of thought started from the response prompt, I promise. For the first reading response, I mentioned Swype typing available on touch screens. Seeing Fishkin’s categorization of traditional keyboards as distant (along the embodiment axis) and none (along the metaphor axis), I though that typing on a touch screen might change the embodiment level to full (the input device is the output device) or maybe near (if we consider the display part of the touchscreen to be different from where the keyboard appears). But then I started to wonder if a touch screen is even a TUI according to their definition, my main point of uncertainty being the nature of the input event. Fishkin defines an input event as “a physical manipulation performed by a user with their hands on some ‘everyday physical object,’ such as tilting, shaking, squeezing, pushing, or, most often, moving.” Does moving a finger on a touch screen count as a physical manipulation if no object is moved around? Would writing with a stylus be considered more of an input event because, in that case, the user is moving an object? What about gesture-capture systems where there is no “everyday physical object” other than our own bodies? Maybe that’s the center of my question: do our own bodies count as “everyday physical objects” around which TUIs can develop (without a non-corporeal intermediary)?